In superconductors, pairs of electrons known as Cooper pairs condense in a "superfluid" that carries electrical current without resistance. 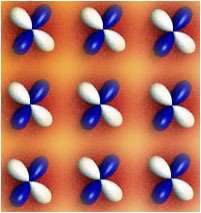 When one of these pairs breaks apart, the unpaired electrons are called quasiparticles. 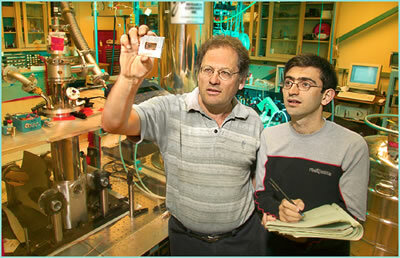 Joe Orenstein and Nuh Gedik inspect a phase mask array. Staff scientist Joe Orenstein and graduate researcher Nuh Gedik in the Materials Sciences Division have developed a new way to study how quasiparticles propagate in superconductors. They used an experimental laser-optics technique familiar in physics and chemistry -- but by adding a clever twist to the standard set-up, they were able to track quasiparticle lifetime and motion for the first time. Though they behave in many respects like ordinary electrons, quasiparticles in superconductors have some highly unusual properties. To begin with, they are admixtures of negatively charged electrons and positively charged holes; an equal mix yields a quasiparticle that is electrically neutral -- yet it still carries spin one-half, just like an electron. Orenstein and Gedik have discovered even more surprising behaviors. To date, they have investigated quasiparticle propagation in two kinds of high transition-temperature (high-Tc) superconductors, the copper-oxide ceramics known as YBCO, or yttrium barium copper oxide, and BSCCO, bismuth strontium calcium copper oxide. The results raise intriguing new questions about the mechanisms of superconductivity in these unusual materials, which would ordinarily be good insulators. A conventional superconductor at low temperature has few if any unpaired electrons, but if the temperature rises even a little, Cooper pairs break and quasiparticles are set loose. While these quasiparticles have no effect on the ability of the superconductor to carry current with zero resistance (their feeble role is completely swamped by the electron pairs), nevertheless their existence can be important in superconductor-based technology. Sensitive detectors based on superconductors, for example, rely on the creation of quasiparticles resulting from the impact of a single nuclear particle or x-ray photon. Because the energy to break a Cooper pair is small, a single energetic particle can generate a shower of hundreds of quasiparticles. Another sphere in which quasiparticles can have an important effect is in the development of quantum computers based on Josephson junctions. In a Josephson junction a thin barrier of insulating material separates superconductors; Cooper pairs can quantum-mechanically "tunnel" through the insulator. In quantum computers of this kind the "qubits," the units of information in quantum computing, consist of superposed states of collections of Cooper pairs. The coherence of such states is critical for the success of quantum computation -- and it can easily be destroyed by stray quasiparticles. The most intriguing questions about the fundamental nature of quasiparticles arise in the high-Tc superconductors, however. Unlike conventional superconductors, in which Cooper pairs are bound in spatially symmetric s-wave states, the pairs in high-Tc superconductors occupy d-wave states, with orbitals shaped rather like crossed dumbbells. Dumbbell-shaped orbitals characterize the d-wave symmetry of copper-oxygen bonds in cuprate superconductors. The momentum vectors of low-energy nodal quasiparticles are aligned at 45 degrees to the bonds; antinodal quasiparticles, whose vectors are aligned with the bonds, have high energy. A quasiparticle's binding energy -- the energy required to break or form a Cooper pair -- can be expressed as a momentum vector; which varies with its orientation to the d-wave orbitals, reflecting changes in binding energy. Very little energy is needed to break a Cooper pair into quasiparticles if their momenta are oriented at 45 degrees to a cuprate's copper-oxygen bonds. Quasiparticles oriented this way are called nodal. Conversely, energetic or "hot" antinodal particles, whose momenta point along the copper-oxygen bonds, form the strongest pairs. Relatively sparse hot particles are hard to observe under normal conditions. It is these hot, antinodal quasiparticles that Orenstein and Gedik create and track in their new experimental set-up. They begin with two simultaneous, very short laser pulses, only 100 femtoseconds long (a femtosecond is a millionth of a billionth of a second). "One beam is divided to create the two pulses," Orenstein explains. "Because the short pulses must be simultaneous, an ordinary beam splitter won't work. Instead we divide the beam by shining it through a phase mask on a diffractive optic." The two "pump" pulses converge on a single spot on the sample crystal and interfere, creating copious amounts of quasiparticles in a regular pattern: constructive interference creates bands with many particles, while destructive interference leaves vacant regions between them. Laser pump and probe beams are split at the diffractive optic (only the probe beams are shown). 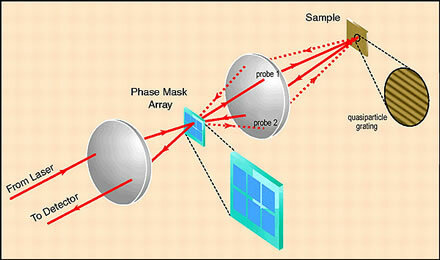 Mirrors focus the pulses on the sample, first to create, then to probe, gratings of quasiparticles. After reflection and diffraction, the probe pulses are recombined by the diffractive optic and directed to a photodetector. By moving a different phase mask into the beam, one of 10 inscribed on the diffractive optic, quasiparticle gratings can be altered without realigning the whole optical set-up. The method creates periodic arrays of quasiparticles, a "quasiparticle grating." "In effect, the phase mask grating of the diffractive optic gets written in the sample," Orenstein says. The bands of quasiparticle density in the sample don't just resemble a diffraction grating, they act like one. This is because the local quasiparticle density affects the sample's index of refraction. When two "probe" beams of lower intensity laser light follow the paths of the pump beams, each is partly reflected and partly diffracted by the quasiparticle grating. The grating decays rapidly as its high-energy quasiparticles recombine into Cooper pairs, or as they diffuse from the crest to the trough of the grating pattern. From decay time alone, there is no way to distinguish between the separate contributions of recombination and diffusion. However, by varying the period of the grating -- the spacing between bands -- that portion of the decay rate due solely to diffusion can, in principle, be isolated and subtracted from the total. Orenstein and Gedik vary the grating by inserting different masks to split the laser beam. Ten masks of different periodicity are inscribed on the diffraction optic; they can be exchanged readily without disturbing the alignment of the beams. This is a good thing, as alignment is greatly complicated by the necessity of having two probe beams. When one of the twin probe pulses bounces off the sample and travels back through the diffractive optic, its diffracted wave is combined with the reflected part of the other's; likewise the reflected part of the second probe's pulse is combined with the diffracted part of the first's. 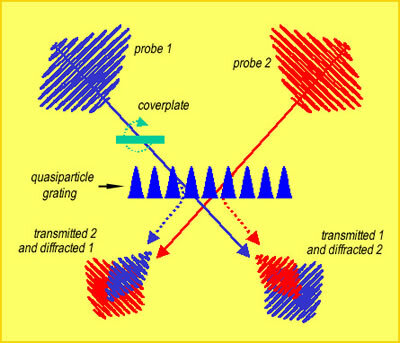 To determine the difference due to grating period, the relative phase of the two probes must be known with precision. Orenstein credits Gedik with realizing that the phase could be calibrated by detecting both probe beams, meanwhile changing their relative phase by rotating a thin pane of glass, or coverslip, in the path of one of them. By watching photodetector output as the coverslip is rotated, the phase can be calibrated in both beams. Two laser pulses probe a transient quasiparticle grating. The grating splits each probe pulse into diffracted and reflected portions (the reflected portion is show here as if transmitted, for clarity). By rotating the coverslip in the path of Probe 1, a differential time delay is introduced into the combined pulses, allowing simultaneous measurement of average quasiparticle density (indicating the rate of recombination into Cooper pairs) and peak-to-trough amplitude of the grating (indicating diffusion of quasiparticles through the material). "In previous versions of the transient grating technique, the only way to calibrate phase was to use a known sample material -- some of those are unpleasant or even dangerous," Orenstein says. "In our set-up, Nuh's trick allows us to measure amplitude and phase independently." Thus two values for the quasiparticle grating can be derived from one measurement at any point in time. One is the average density of quasiparticles, which depends on the rate of quasiparticle recombination into Cooper pairs. The other is the distance from peak to trough in the bands of quasiparticles in the grating, a value that depends on the diffusion of quasiparticles through the material. With their new technique Orenstein and Gedik have established that in YBCO, quasiparticles live a remarkably long time and travel a remarkably long distance. In a lifetime of about 100 picosends (a picosecond is a trillionth of a second) they move some 2,000 angstroms (an angstrom is a ten-billionth of a meter), bouncing off vibrations on the crystal lattice or other quasiparticles about 1,000 times during the process. Preliminary results from studies of BSCCO indicate a virtually identical rate of diffusion. This poses a mystery: other kinds of studies of quasiparticle lifetimes in BSCCO have suggested that much shorter travel distances would be expected of energetic quasiparticles, because of variations in superconductivity on a small scale. Is it possible that quasiparticle diffusion in cuprate superconductors has universal properties that are immune to differing degrees of local order? The results pose not only a puzzle but an opportunity: given the long lifetime and the long-range propagation of energetic quasiparticles in high-Tc superconductors, it may be possible to devise more sensitive, less expensive devices like particle detectors and quantum computers that depend on them -- or depend on controlling them. Orenstein and Gedik's new technique has uncovered fascinating unknowns and possibilities in the study of high-Tc superconductors. The same technique provides one of the best tools for answering the many new questions it raises.